A collision with an 18-wheeler always carries the risk of serious injury, but these injuries are especially deadly when a car becomes caught underneath the truck’s trailer. Underride accidents are one of the more common types of semi-truck crash, and unfortunately, they are overwhelmingly likely to be fatal. Tractor-trailers have a higher profile than most passenger vehicles, and the top of a car may only reach as high as the rig’s wheels. In a collision, a smaller car can slide into empty space beneath the trailer, causing what is known as an underride crash. Rear-end crashes. Rear-end collisions are the most common form of underride accident. If a trucker slams on his brakes suddenly, the car following may not have time to stop, becoming wedged beneath the back of the trailer. These crashes are most likely to happen when the trailer is parked at the side of the road or moving slowly to enter or exit the roadway. Drivers and front-seat passengers have suffered fatal injuries in these accidents, including decapitation. Side impact collisions. Hundreds of people are killed every year in collisions with the side of a trailer. Unprotected by side guards, a trucker who merges into a car’s path may shear the car’s roof off as the vehicle slides under the trailer. Offset crashes. Accident researchers have recently raised awareness of the offset underride crash, which occurs when the car following strikes the back of a trailer on one of its corners rather than head-on. These collisions can still be fatal as the hard metal corner of the trailer enters the driver’s or passenger’s compartment. 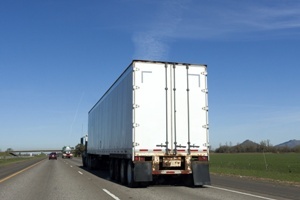 The U.S. Department of Transportation has instituted mandatory guards and markings for most commercial trucks. All commercial trailers are required to have rear guards, and the back and sides must have retroreflective tape in a red and white alternating pattern. The tape not only makes it easier to see a trailer in the dark, but its standardized placement clearly outlines the shape of the trailer to oncoming vehicles. Lack of guards. The required underride guards include two vertical steel bars extending down from the truck’s frame, with a horizontal crossbar bar about two feet from the ground. However, not all trailers have rear guards installed—and federal regulations do not require guards along the sides of trailers. Improper guards. Trucking companies may install guards that are not the right size for the vehicle or do not meet strength and impact regulations. Some guards are also inadvertently placed much higher than intended, rendering them useless in a crash. Defective tape and lights. Reflective tape, taillights, and running lights can all improve visibility, but only if they are in proper working order. Reflective tape must be evenly spaced along at least 50% of the length of the trailer, and drivers should ensure that the tape is not dirty, peeling, or worn before each journey. Drivers should also check that taillights and running lights are clean and operational. Outdated guards. Many lawmakers have proposed legislation to strengthen existing guards and make side guards mandatory on all commercial trailers. Actions in current bills include strengthening rear guards at the corners, ensuring that underride guards are installed properly, and requiring side guards similar to those in European countries. Unfortunately, the trucking industry is in opposition to many of these measures due to increased costs. Trucker errors. While trucker may not be to blame for a defective underride guard, they can be liable if their actions directly led to the crash. A trucker who fails to use road flares or reflective triangles when parked on the shoulder, does not use emergency flashers when entering or exiting the roadway, or does not follow the rules of the road may be guilty of negligence. If you or someone you love was injured in a truck underride accident, our attorneys can perform a thorough investigation into your case while you take the time you need to heal. Contact GriffithLaw today for an evaluation of your case at no cost to you, or order a free copy of our book, The 10 Worst Mistakes You Can Make With Your Tennessee Injury Case.